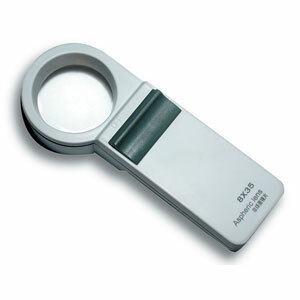 High Power Pocket Aspheric Magnifier. Special features: Newly designed Aspheric Lens with deluxe blue coating that provides superior optics. Noted for its simple maintenance in changing batteries. Large raised switch is easier for arthritic fingers. High power range provides distortion-free image. 1. Magnification - 5X; Mag - 28D; Lens Size - 60mm. 2. Magnification - 8X; Mag - 28D; Lens Size - 35mm. 3. Magnification - 10X; Mag - 36D; Lens Size - 35mm. 4. Magnification - 12X; Mag - 44D; Lens Size - 35mm. 5. Magnification - 14X; Mag - 50D; Lens Size - 35mm.